Get the specific care you need for your hard contact lenses with solution for hard contact lenses. Keeping your lenses clean with a multi purpose solution, disinfecting solution or contact lens cleaner can help them feel like new each day. Choose your solution for hard contact lenses to clean, disinfect or store your contacts for comfortable wear here at Walgreens.com. You can keep your hard contacts fresh with contact lens cleaners. 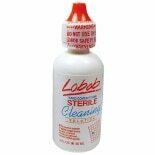 Choose a contact disinfecting solution to clean away proteins and fight bacteria. These contact solutions can keep your eyes healthy and safe from infection and your lenses comfortable. Some solution for hard contact lenses can also help moisten and refresh your eyes throughout the day. You can fight dryness and discomfort with rewetting drops. Contact lens eye drops can hydrate and soothe while you wear your lenses. Also browse contact lens cases for sanitary storage of your contacts. Your options include functional fashion contact lens cases that come in different colors, and contact cases that make it easier to spot your lenses while they're in the case. If you have a valid prescription from your eye care practitioner, you can reorder your lenses right here at Walgreens.com. Many popular brands are here, including Proclear, Freshlook and PureVision. We carry a selection of lens types for many needs, from color lenses and daily disposables to multifocal lenses and monthly disposables.